Norway has received a bit more attention lately due to the popularity of Disney’s Frozen and the Discovery Channel’s “The Vikings”. 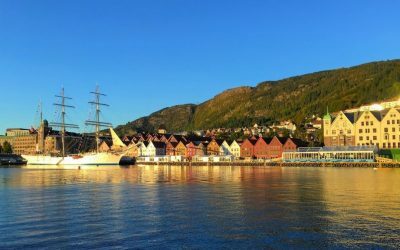 Norway is also consistently listed as one of the “happiest” countries on the planet, not too shabby for a place with so much cold weather and winter darkness. For a small country, it has much to offer in natural beauty, history, and culture. And there are unique ways to sample it in depth or in a few days. One of the most fun and interesting trips we ever took is a tour we refer to “Norway in a Nutshell. This is something you do on your own using a train and boat. We started in Oslo, caught the Flam railway and enjoying a scenic train ride to the town of Flam. This is not just any train – it’s geared to tourists and makes stops for photos of waterfalls and mountain scenery as you go along! Flam is at the edge of a beautiful fjord, where you can enjoy dinner with one of the best views in Norway and spend the night in a convenient hotel. The next day we took the ferry to Bergen, once again sampling some of the best scenery Norway has to offer. Arriving in Bergen, we found a city jam packed with history and something for everyone. While there is no set tour to do all these things, it is possible to recreate it as an add-on if you start in Bergen and want to end in Oslo. Our Fjords in a Nutshell tour will allow you to do this – you just have to tell the tour company your wishes, and they can set it up so you can have almost any option. But there are several other tours available as well, so if you are a little adventurous you can use many of them as building blocks to do exactly what you want. Be sure to check out our Bergen Tours and Oslo Tours to check out all the possibilities!